GRAND FORKS, ND (June 24)- One week after being invaded by the World of Outlaw STP Sprint Car Series, the Northern Outlaw Sprint Association will reload for another action packed weekend of racing. First, the winged warriors will head north of the border to the 3/8th mile track of Red River Co-op Speedway in Winnipeg, Manitoba. 2014 will mark the second consecutive year the 410 cubic inch Sprint Car touring series takes over the Canadian speedway after a five year hiatus. 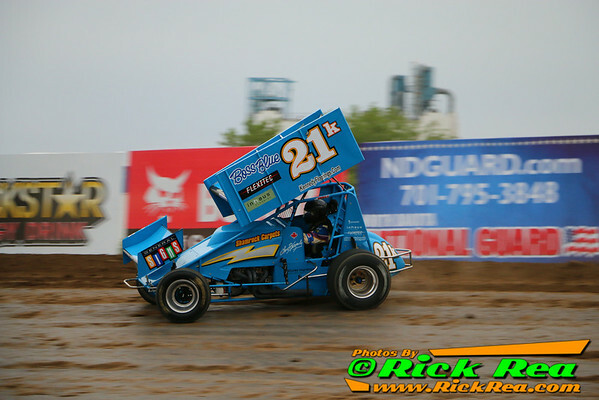 Mark Dobmeier has claimed the last two victories (2013 & 2008), while hometown driver Lou Kennedy Jr. sits atop the all-time wins list at RRCS with seven victories. The three Canadians of Kennedy Jr., his son Thomas Kennedy, driver of the Kennedy Flooring #20K, and his niece Amber Balcaen, rookie driver of the Apex Motorsports #10 will try to defend their home turf against the stout NOSA competition this Thursday night for the first of two events at RRCS this season. On Friday night, the series will have the night off from River Cities Speedway. That doesn't mean they won't be racing, however, as they will head south back to the tight 1/4 mile of Buffalo River Race Park in Glyndon, Minnesota for their make-up show from the May 25th event that was washed out. It will be a complete event with heat races and a 25 lap A-Main. Thomas Kennedy will be looking to repeat his performance against the All-Star Circuit of Champions last season at BRRP where he claimed the $5,000 victory.